Kudos to researchers from the Massachusetts Institute of Technology for having a sense of humor. On Thursday, a team from the illustrious tech school released a video showcasing the abilities of its latest robot creation: a 20-pound Mini Cheetah capable of executing perfect backflips — the first four-legged robot to demonstrate that skill. But the best part of the video isn’t seeing the bot expertly backflip, spin in circles, or pronk — it’s watching all its failed attempts along the way. The entire video is worth watching, but if you need a laugh to get you through your Friday, skip ahead to the 1:26-minute mark. That’s when MIT starts showing off the “mistakes” it made while developing the Mini Cheetah robot. The bloopers include several failed backflip attempts and a quick scene in which the bot skitters across a floor like it’s being electrocuted. A personal favorite occurs at 1:34 when a team member gently tosses Mini Cheetah to the floor and it crumples on impact. 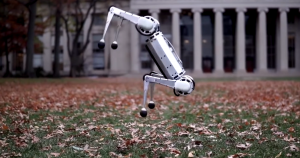 Now that the MIT team has worked out the kinks, maybe it can reach out to Boston Dynamics to set up a play date between Mini Cheetah and the company’s SpotMini robo-dog. Who wouldn’t want to see what sort of hijinks those two could get into?